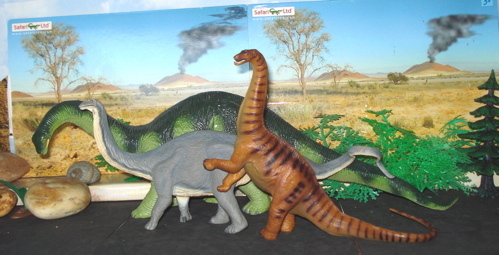 The latest in Sauropod toys is the 2010 Apatosaurus from Safari Ltd.
Just another Sauropod tail tale. 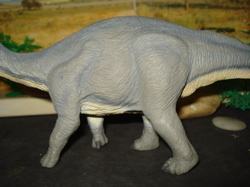 The latest long-neck/long-tail figure to come from Safari Ltd is their 2010 Apatosaurus. They have been innovative in their creations up till now and this Apatosaurus is no exception. From its expressive face to its recurved tail it is exceptional. 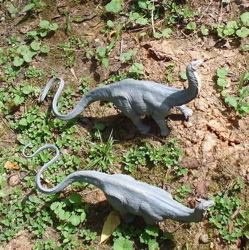 As theory has it the great Sauropods used their tails like whips to defend themselves. 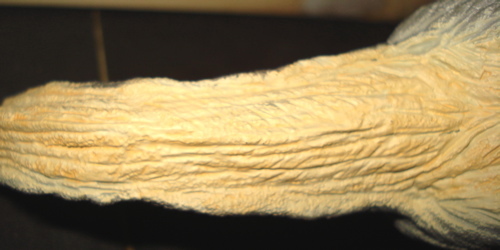 If the tip of a towel in a shower can break the sound barrier you can only imagine what the tip of a thirty-foot long tail powered by thirty tons of muscle could do. are put upon by a pack of Safari Ltd Dilophosaurus. "Watch Out! Watch Out! Behind you!" 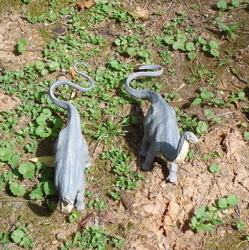 They quickly turn tail and the end of this tale is foreseen by the Dilophosaurs. "Uh oh! Watch out for those tails! Let's get outta here!" Retiring the very successful "upright" 1996 Apatosaurus in 2009 Safari Ltd has introduced their newest Apatosaurus for 2010. This one is as unique and innovative in its own write as the '96 was in its time. We'll get into all that shortly. But first... 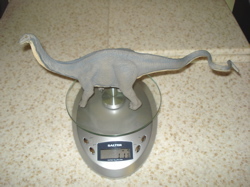 In This Corner, weighing in at eleven and seven-eighths (11.875) ounces (335 gms) and measuring eighteen (18) inches (45.75 cms) in length we present the newest member in the Sauropod Dinosaur toys family. 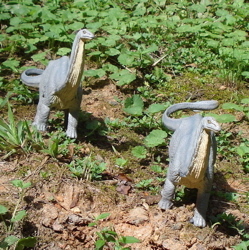 Given the length of seventy (70) feet for an adult Apatosaurus this scales out to 1/47 scale. Ten inches of this figure is tail. That's 55%. "Everybody outta the water! Except for you two." whose appearance persuades them to seek more pleasant surroundings. but being reminded doesn't mean there is a worthwhile comparison to be made and the quality of the 2010's head is obvious. Just another indication of how far modern production techniques have advanced. 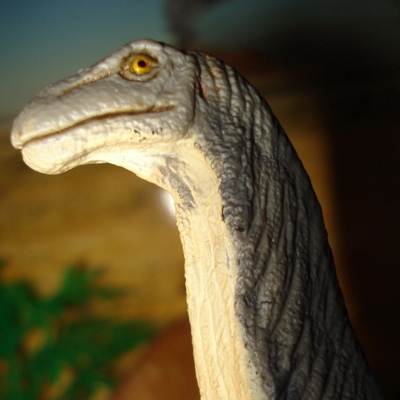 That Struthiomimus was truly state-of-the-art in 1961. The MPC never was. which made up in pure massiveness any thing it may lack in detail or accuracy. 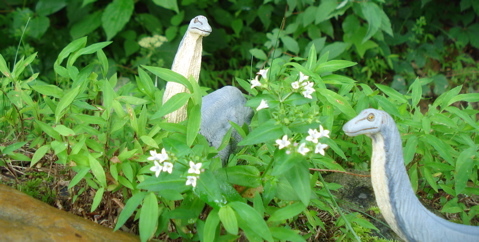 With the local river having proven itself to be other than safe our Apatosaurus herd heads inland. But nowhere is truly safe when you taste good and they draw the attention of a pair of 2007 Safari Allosaurus. Safety comes in the form of their whip-like tails, relying on themselves even in the face of a multi-species assault. Please note the more toy-like quality of the 1996 figures as compared to the contemporary ones. Looking at this Sauropod replica from the side provides a good overall view and a sense of the unity of the whole. Taking a closer look at the actual body of this figure we see the dynamic look of the figure, left rear foot just raising up as the forefoot comes down; right forefoot beginning to rise as the right rear is planted for support. Not a race-horse's trot but the determined stride of a healthy Sauropod. These close-ups of the Sauropod sides (above and left) show the superb attention to detail on this Safari Apatosaurus. 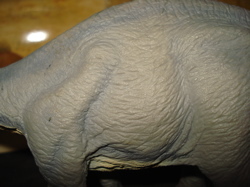 The skin appears to be quite pachyderm-like, not scaly but quite thick and ripply. The coloration is overall gray across the upper and lateral portions with "highlighting" in darker blue-gray on upper edges with charcoal-gray along the delineation of sides and bottom (throat, belly and throat) which is a uniform light beige or cream. As can be seen (above left) the detailing at that juncture is extraordinary. which is equally attractive and even more interesting in the ant's eye view (below). Here we see the belly of the beast and the contrast of colors between the lower and upper parts of this miniature thunder-lizard. 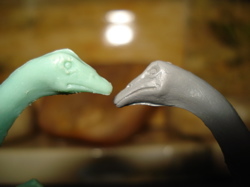 which show the attention to detail throughout this miniature replica Sauropod. Words fail me. That's why there are so many pictures. Imprinted on the center of the belly is the manufacturer's name (Safari Ltd), date of copyright(? )/production (2010) and place of Manufacture (China). 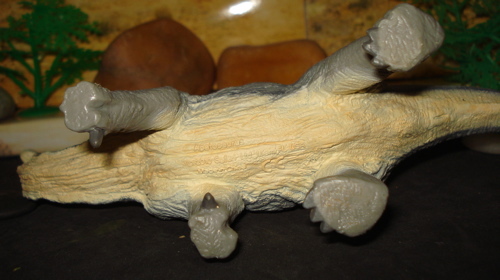 Unique among most figures is that this imprint isn't on a flattened, detail-less, section of the belly but rather is simply imprinted across the detail. The 2010 Safari Apatosaurus is a Sauropod toy that may not live all that large but it doesn't live boring or safe, that's for sure! The 2010 Safari Ltd Apatosaurus is a Sauropod after my own heart. I saw the rather unimpressive pictures on the internet that accompany the product advertising and was not impressed. In fact I wasn't particularly impressed until I began taking an actual look at this figure. It is quite brightly colored (despite it being an overall multi-chromatic gray) and it is certainly bright-eyed with its little yellow eyes. 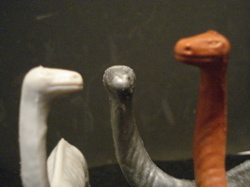 It has the most personality in its face of any Dinosaur toys Sauropod I have ever seen. Being brand-new it is impossible to determine its ultimate collectibility and long term value. Irregardless of that fact it is more than a worthy piece to pick up for your collection. Its detail and dynamic sculpture truly are unique compared to any other manufacturer. This is comparable to the recent Safari Ltd (opens new window) 2006 Dunkleosteus*, Tyrannosaurus and Pterosaur*, the 2007 Allosaurus, the Stegosaurus, the Triceratops and the Velociraptor; the 2008 Brachiosaurus, Dilophosaurus, Nigersaurus, the Postosuchus*, the Scutosaurus*, and the Tapejara*; the 2010 Coelecanth*, Kentrosaurus, Liopleurodon* and Rhamphorhynchus*. (Starred * figures are not Dinosaur, Dinosaur toys, but will be or have been reviewed.) 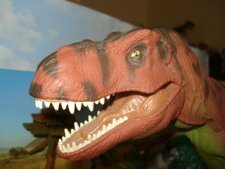 I only put up this extensive list of figures because they are the leading edge of quality (as measured by lifelike realism and detail) in Dinosaur toys today. 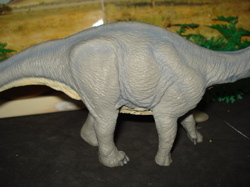 This Sauropod figure can be found for sale ranging from (USD) $6.94 to $11.99 (results of a cursory search) and at any brick & mortar toy store that carries Safari Ltd products. Which are all your better ones. As for toxicity, there is none. Not only do these have the Euro-seal of approval (arf-arf "CE") they have passed all the test that the United States Congress has legislated (tests the congress itself couldn't pass) for lack of toxicity. Yet they remain rather bland and tasteless, with no nutritional value, so eating them is not recommended. But if Bowser or baby should chew one up don't worry. It will come out okay in the end. Overall a nine out of ten for this terrific figure, well worth its price and a definitive addition to any collection. A must-have for Sauropod lovers. 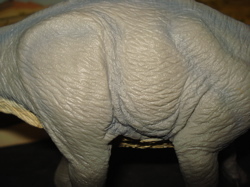 You have been reading about the 2010 Safari Ltd Apatosaurus. 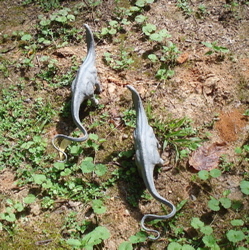 Click this link to return to our Apatosaurus page to read about more of these marvelous Sauropods.